Networking with the right people is essential for the success of any business (and by extension, for those involved with that business). Whether you're meeting a client to discuss a new project or attending an industry conference to pitch your product, establishing connections matters a lot. And nothing establishes professional contacts better, than a simple exchange of business cards. Despite the growing popularity of e-mail and social media, business cards remain the quickest means of exchanging contact information. That said, address books have now gone digital, and no one has the time (or patience) to manually save business card details to their smartphones. Fear not, for business card scanner apps are here to help. Powered by Optical Character Recognition (OCR) technology, they use your smartphone's camera to scan business cards and automatically save the contact details on them to your smartphone. There are dozens of scanner apps available for iOS and Android, with differing features. To help you choose the one that's perfect for your needs, we've rounded up the best business card scanner apps. Among the leaders in Optical Character Recognition (OCR) technology, ABBYY offers a diverse range of language-based software products and services. And its business card scanner app is definitely the best in the business (no pun intended!). ABBYY Business Card Reader lets you scan and store contact information from business cards in up to 25 languages. The company's award-winning OCR technology makes for accurate recognition of all contact details, such as names, organizations, phone numbers and e-mail addresses. The app is smart enough to detect the edges of business cards and automatically crops out any unwanted backgrounds. Any data that's left unrecognized is highlighted in blue and can be manually corrected. ABBYY Business Card Reader can automatically fill in missing fields such as country codes and extensions and is capable of correcting typos in recognized information. 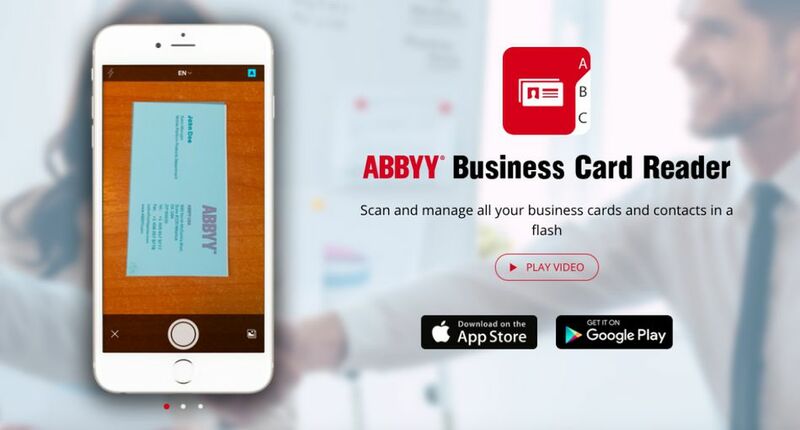 Having a robust synchronization framework, ABBYY Business Card Reader can back up contact data across smartphones, tablets, PCs and other devices. The data can be backed up automatically or manually as per requirement, and recognized contacts shared via email as VCard or JPEG files. With an expansive feature set and an intuitive user interface, CamCard makes digitizing and managing your business card contacts a cakewalk. CamCard lets you easily scan business cards and store their contact information on your smartphone. The digitized cards can be exchanged with others directly from the app. To make the saved contact information even better, CamCard allows you to add notes and reminders to contacts. The batch scanning functionality makes it possible to save information from multiple cards in one go. The 'Secretary Scan' mode lets executives invite their personal secretaries to save contact details on their behalf. When CamCard stores information about a contact, it keeps track of any future changes in their profile details. So when a saved contact gets a promotion or changes organization, you get notified of that. All business card information saved by CamCard is securely stored in the cloud and synchronized across multiple devices, so you can access it from any device (e.g. smartphones, tablets). Since the majority of the businesses rely on CRM (Customer Relationship Management) systems to keep track of interactions with their customers and drive sales growth, an app that lets them store contact details directly to CRM systems can be of immense help. If that's what you are looking for, ScanBizCards is just what you need. Even though it can be used by individual users just fine, ScanBizCards is primarily targeted at enterprises. It offers unlimited business card scans, which can be either added to existing contacts or saved as new ones. In case the automatic recognition of details isn't accurate, you can submit cards for manual transcription. The app's premium version includes two manual transcriptions and more can be purchased. ScanBizCards supports many popular CRM systems, including SalesForce and SugarCRM. Contacts can be exported in CSV format, and there's support for third-party services such as Evernote, too. The app can scan two-sided business cards easily and lets you forward scanned contacts to other users. Its unique 'cover flow' 3D view makes searching and sorting scanned business cards extremely simple. ScanBizCards is available for both iOS and Android. For those who have to routinely deal with hundreds of business cards, using an app that can scan only one card at a time isn't going to cut it. This is where Wantedly People comes into the picture. Perhaps the best bulk business card scanner out there, Wantedly People lets you scan up to 10 cards in one go. What's great is that no matter how the cards are scattered, Wantedly can effortlessly capture details from all of them. It's very easy to use as well. Just scatter out there cards, tap the button in the app and it'll do the rest. Wantedly People's Optical Character Recognition (OCR) technology detects and analyzes text on cards to instantly generate new contacts. The app uses Artificial Intelligence (AI) to improve the accuracy with which it scans business cards. Once a contact is saved, you can search for it using any saved field. You can call and e-mail contacts with just one tap and even chat with them using Wantedly's built-in agile business chat platform. Wantedly People lets you create your own profile for others to look up. Business cards can be shared via email or temporary URLs. It may look like a simple business card scanner app, but there's a lot more to Sansan than meets the eye. In fact, the app is powered by its namesake, a cloud-based contact management system for corporations. Centered around business cards, Sansan lets you (and your organization) build a complete digital contact database that can be accessed from anywhere. The app makes it easy to scan business cards, which are then digitized both automatically (using OCR) and manually (by Sansan's team). This two-pronged approach ensures both speed and accuracy. The scanned contacts are automatically stored and organized in your company's database. You can add tags, notes and meeting reports to further enhance and optimize the database. Companies can adjust the sharing level of contacts with employees and a contact can be called or e-mailed directly from the app. Sansan's API support makes it possible for contact information to be shared with third party tools like email services, address books and CRMs. The largest software company in the world, Microsoft makes some of the best productivity-focused digital products and services. One of them is Office Lens, an app that makes quick work of digitizing business work. A full-featured document scanner app, Office Lens not only lets you scan business cards, but also documents, whiteboards and posters. The app is extremely easy to use and automatically recognizes content with astonishing accuracy. It might not have advanced CRM integration or manual transcription support like some other business card scanner apps, but Office Lens packs a lot of features for a free app. There are multiple capture modes in the app, including a Business Card mode. Once selected, it can extract contact information from a scanned card and save it to your address back. The details are also saved to Microsoft's OneNote note-taking service. When it comes to digital note-taking services, Evernote is a name that needs no introduction. From Web clippings to photos, Evernote lets you organize and archive all kinds of digital information. Turns out, it's also pretty good at scanning business cards. Evernote works like any other business card scanner out there. It uses your smartphone's camera to scan a card and saves its details to your Evernote account. Once saved, the contact details can be easily shared with other users. What's interesting is that Evernote can also capture contact details from other professional services such as LinkedIn. This ensures that you have all the information about a contact in one place. Just because something is free, doesn't mean it can't be good. It's true for a lot of things, and it's certainly true in case of CardHQ. It's actually surprising that CardHQ is completely gratis, given the laundry list of features it has. The fact that it's lightweight only makes things better. CardHQ lets you scan an unlimited number of business cards, and can scan cards as fast as three seconds. The app is also quite accurate when it comes to detecting text and scanned cards can be shared through a variety of services such as e-mail, WhatsApp, Facebook and Twitter. With CardHQ, you can scan multiple cards at once and take a backup of all of them. The app has quite a straightforward UI and supports a whole bunch of languages.